Moved down to the second match. Aerostar appeared, but he was still in a sling and not medically cleared. 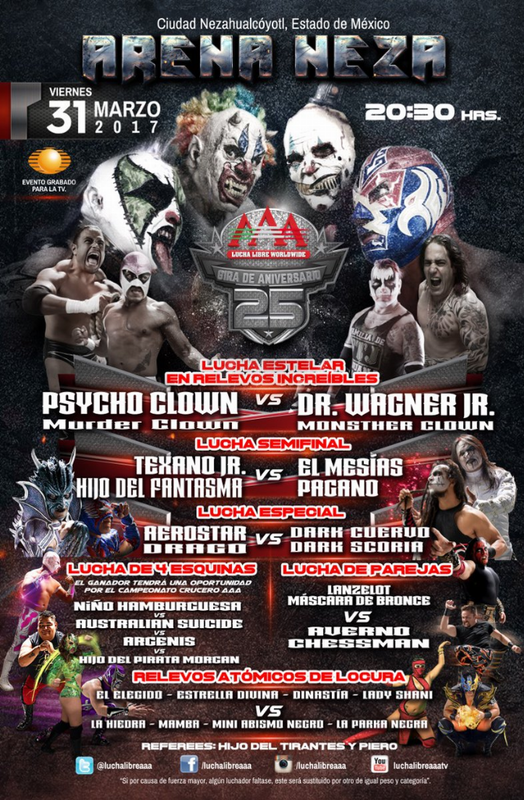 Vampiro appeared to put Bengala in the match instead. The announced Cuervo & Zorro and Bengala & Lider teams were merged into one (and Escoria was there to interfere), but Angelico still pinned Lider for the win. This was originally a lumberjack match with all three Apaches versus all three OGT. Instead, it was announced Mary Apache (car accident?) and El Apache (personal issues) were out of action. 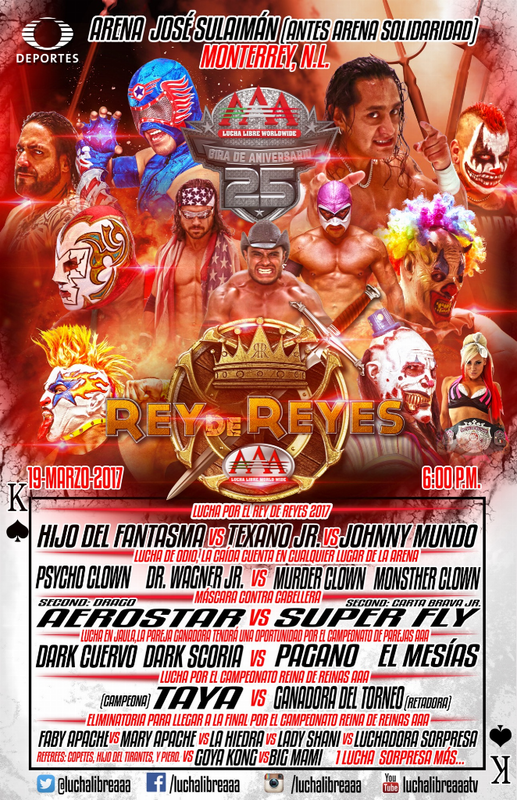 Averno offered Faby a singles match with Ricky Marvin, where Faby would win the trios titles if she won but would have to retire if she lost. (It's listed as championships vs careerS, so Faby may have put the entire families' career on the line.) Faby accepted and defeated Marvin to win the trios titles. The Apaches are eight champions, Faby & Mary the first women to win the titles. OGT lose the titles on their second defense (first on TV). 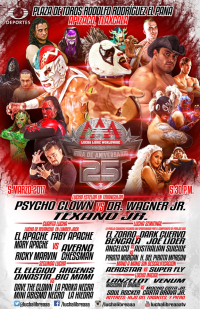 Scheduled as a three way with Psycho Clown, but Psycho didn't appear. Vampiro instead made a singles match, with Texano's title on the line. Late in the match, Psycho Clown appeared in the crowd bloodied, and that distracted Wagner to give Texano the win. 1) ? & ?? ?? ??? & ???? Prior to the match, Dorian Roldan and officials from Impact Wrestling (including Jeff Jarrett) came to the ring to announce a deal between AAA & Impact. They were booed. Before this match started, Vampiro put all three men's titles on the line. Fantasma got a visual pin with a Thrill of the Hunt on a chair on Texano, but the referee was done. Texano was stretchered away. Mundo beat Fantasma after a run-in by a mystery man (Kevin Kross, but specifically given no name in the recap.0 3rd defense of the Latin American title. Fantasma loses in his eight defense of the cruiserweight title. Mundo is the 9th champion. Texano loses in his heavyweight fourth defense. Mundo is 14th champion. Ayako becomes the 20th champion. Taya's title reign ends after 2.5 years, and on her fourth defense. Super Fly earlier appeared on the show saying he'd hurt his arm wasn't cleared to wrestle but he was going to do it anyway. Bloody match, with Aerostar doing a big dive off the upper level. Super Fly used knuckles to KO Aerostar for the win. Vampiro restarted the match and Aerostar came back to win. Shani, who's now a tecnica without explanation, pinned Hiedra. Dalton Bragg, who advanced to the semifinals of Saturday's La Llave de la Gloria, also simultaneously advanced to a TV debut. All but the women and the minis were replaced in this match. Earlier in the night, Texano (Fantamsa's original partner) announced he had a grade two neck strain and would be out for some time, but vowed not to retire. 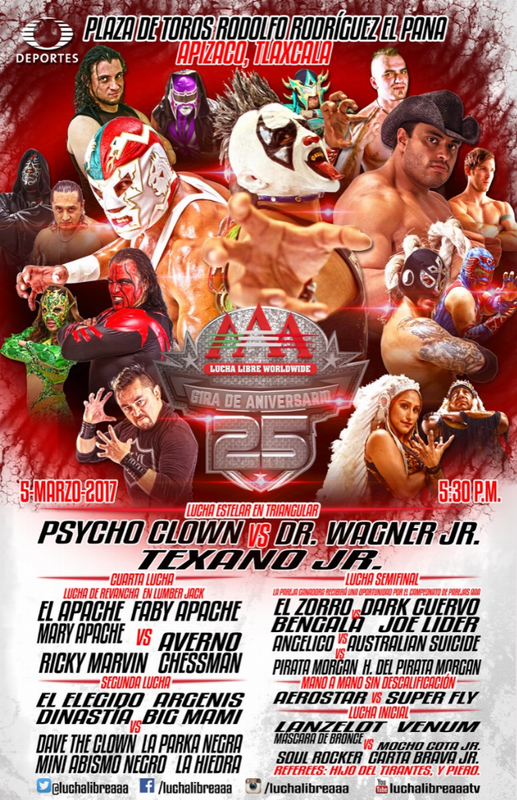 Argenis was subbed in (his cruiserweight title match was removed), and Chessman & Averno replaced Mesias (in Orlando) and Pagano. Ricky Marvin seconded the OGT team, but accidentally cost them match. Chessman & Averno attacked Ricky after the match, kicking him out and replacing him with Super Fly.